Surrounded by a half-dozen tournament security guards, Roger Federer made the long, slow trek across the U.S. Open grounds from the court in Louis Armstrong Stadium to the locker room in Arthur Ashe Stadium. Head down, he carried a racket bag on his left shoulder. The hour was a little past 8 p.m. on Monday evening, one week to the day before the men's final is scheduled to be played in Flushing Meadows, and Federer was, once again in this difficult season, heading home far earlier than he is used to at Grand Slam time. And the words he spoke after his surprisingly straightforward 7-6 (3), 6-3, 6-4 loss to 19th-seeded Tommy Robredo of Spain made it sound as if Federer is having doubts about his game. This caps a poor-by-his-standards Grand Slam season for Federer, whose record collection of 17 major trophies includes five in a row at the U.S. Open from 2004-08. This is the first season since 2002 that Federer did not reach at least one final at any of the four Grand Slam tournaments. That year also marked the last time Federer was ranked lower than he is now at No. 7. He exited in the semifinals at the Australian Open in January, the quarterfinals at the French Open in early June, and the second round of Wimbledon - against a player ranked 116th, to boot - in late June. That ended Federer's record run of reaching at least the quarterfinals at 36 consecutive Grand Slam tournaments. Now, thanks to Robredo, Federer has a new, unwanted streak: Two consecutive losses before the quarterfinals at majors. This time, the early exit prevented Federer from meeting rival Rafael Nadal in the round of eight at Flushing Meadows, where they have never played each other. In an interview the day before the tournament began, Nadal spoke about how he and Federer ''deserved a final here,'' the way they met in four title matches at the French Open, three at Wimbledon, and one at the Australian Open (Nadal won six of those eight, part of an overall 21-10 head-to-head edge). Nadal reiterated that sentiment after beating 22nd-seeded Philipp Kohlschreiber of Germany 6-7 (4), 6-4, 6-3, 6-1 on Monday night in the fourth round. While Federer has been known in the past to chalk up poor performances to a bothersome back or bad weather, this time he kept uttering phrases that were critical of his own play against Robredo, against whom he'd been 10-0. 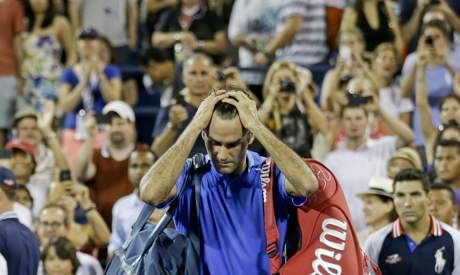 ''I struggled throughout, which is not very satisfying, to be honest,'' Federer said. ''I kind of feel like I beat myself,'' he added, moments later. ''I kind of self-destructed, which is very disappointing,'' he continued. Perhaps trying to convince himself as much as others, Federer tried to offer a positive outlook toward the end of his news conference. Robredo has been ranked as high as No. 5, albeit back in 2006, and this is his seventh trip to the quarterfinals at a major. But he had been 0-7 in the U.S. Open's fourth round. Against Federer, he managed to win only three of the 27 previous sets they'd played. The weather delays also prompted the tournament to postpone two-time Australian Open champion Victoria Azarenka's fourth-round match against 2008 French Open champion Ana Ivanovic until Tuesday. The winner will face Daniela Hantuchova of Slovakia, who got past American wild-card entry Alison Riske, a 23-year-old who grew up in Pittsburgh, 6-3, 5-7, 6-2 on Monday. Two women's quarterfinals are Tuesday: defending champion and No. 1-seeded Serena Williams against No. 18 Carla Suarez Navarro of Spain, and 2011 French Open champion Li Na of China against No. 24 Ekaterina Makarova of Russia. The last four men's fourth-round matches also are on Tuesday's schedule, including No. 1 Novak Djokovic against 43rd-ranked Marcel Granollers of Spain, and defending champion Andy Murray against 65th-ranked Denis Istomin of Uzbekistan. In men's action Monday, No. 4 David Ferrer of Spain, the runner-up to Nadal at the French Open this year, moved on by beating No. 18 Janko Tipsarevic of Serbia 7-6 (2), 3-6, 7-5, 7-6 (3). In the quarterfinals, Ferrer will play No. 8 Richard Gasquet, who entered the day 1-15 in fourth-round Grand Slam matches but erased a match point and withstood 39 aces from No. 10 Milos Raonic to win 6-7 (4), 7-6 (4), 2-6, 7-6 (9), 7-5 on Court 17. A long line of fans snaked across the grounds when Federer-Robredo was shifted to Armstrong, which holds about 10,000 spectators and has a lot less room separating the playing surface from the stands. Federer, accustomed to playing in Ashe, last competed in Armstrong in 2006. He said that was not a factor in Monday's outcome, though. The blame, instead, belonged with his inability to hit his strokes the way he wanted. Federer was particularly ineffective when he had chances on Robredo's serve. Time and again, Federer would get an opening, a chance to begin the long climb back into the match. And he kept letting those opportunities slip by. That's true. Robredo went 4 for 7; Federer was 2 for 16, including 0 for 12 in the last two sets. Soaked with perspiration, Federer flubbed a backhand to waste the last of five break points he had in the fourth game of what turned out to be the final set. He kicked the offending ball, a rare sign of frustration from the generally unflappable Federer.